After the success of the assault operations had gained us a foothold on French soil, there followed six weeks of grueling struggle to secure a lodgement area of sufficient depth in which to build up a striking force of such magnitude as to enable us to make full use of our potential material superiority. The process took longer than we had expected, largely owing to the adverse weather conditions which repeatedly interrupted the flow of men and stores across the Channel. The enemy fought tenaciously to contain our beachheads, though he was at no time able to collect the strength to constitute a serious offensive threat. Consequently our operations fell somewhat behind the planned schedule, but we were able to build up our armies to a power which made it possible, when the breakthrough came, not only to regain the time lost but to outstrip the anticipated rate of advance. Our immediate need was to expand our shallow beachhead inland to a depth sufficient to secure the beaches from enemy gunfire in order that the build-up might proceed without interruption. We also had to capture the port of Cherbourg, which was essential to permit of the rapid inflow of the vast stocks of war material required for future operations. Then, as our strength grew, we needed space in which to maneuver and so dispose our forces that the best use could be made of our material assets and a decisive blow be delivered at the enemy. To this end we had to secure Caen and establish bridgeheads across the Orne and Odon Rivers, to eliminate the possibility of the enemy's driving a wedge between the Allied sectors east and west of the Vire River, and to extend our hold upon the southern part of the Cotentin Peninsula. Meanwhile, the enemy found himself in a dilemma. He had pinned his faith on Rommel's policy of concentrating upon the beach defenses, and when they failed to prevent the establishment of the Allied beachheads, he lacked any alternative means of combating the threat offered. Rommel's confidence in his mines and concrete was indeed to have disastrous results for the German Army. There being no system of defense in depth, when the beaches were forced the enemy lost the initiative and never subsequently succeeded in regaining it. The hand of von Rundstedt, endeavoring to remedy the errors of his lieutenant, became apparent after the first 2 or 3 weeks of the campaign, when desperate attempts were made to form a mobile armored striking force in reserve; but it was too late. The enemy had been forced, by reason of his shortage of infantry, to use his armor in purely defensive roles. Once this armor was so committed, our constant pressure made it impossible for the enemy to withdraw his mobile forces for more appropriate employment until early in August, when the breakthrough of the United States forces on the west flank had already sealed the fate of the German Seventh Army. Lack of infantry was the most important cause of the enemy's defeat in Normandy, and his failure to remedy this weakness was due primarily to the success of the Allied threats leveled against the Pas-de-Calais. This threat, which had already proved of so much value in misleading the enemy as to the true objectives of our invasion preparations, was maintained after 6 June, and it served most effectively to pin down the German Fifteenth Army east of the Seine while we built up our strength in the lodgement area to the west. I cannot overemphasize the decisive value of this most successful threat, which paid enormous dividends, both at the time of the assault and during the operations of the two succeeding months. The German Fifteenth Army, which, if committed to battle in June or July, might possibly have defeated us by sheer weight of numbers, remained inoperative throughout the critical period of the campaign, and only when the breakthrough had been achieved were its infantry divisions brought west across the Seine-too late to have any effect upon the course of victory. A certain amount of reinforcement of the Normandy front from other parts of France and from elsewhere in Europe did take place, but it was fatally slow. The rate of the enemy's build-up in the battle area during the first 6 weeks of the campaign averaged only about half a division per day. By 16 June he had committed his four nearest panzer divisions to battle, and his six nearest infantry divisions were brought in by 19 June. But it was not until the beginning of July, when the scale of the Allied effort was no longer in any doubt, that reinforcements began to arrive from more distant locations. This process of reinforcement was rendered hazardous and slow by the combined efforts of the Allied air forces and the French patriots. Despite the comparative speed with which tracks could be repaired, our prolonged bombing campaign against rail centers and marshalling yards had effected a marked reduction in the operating efficiency of the rail systems of northeast France and Belgium, and by D-day 27 percent of the locomotive servicing facilities, 13 percent of the locomotives themselves, and 8 percent of the other rolling stock had been destroyed. All but two of the Seine bridges below Paris were cut by Allied bombers before D-day, and during the subsequent weeks these surviving ones were also demolished, together with the principal road and rail bridges across the Loire. Thus the battle area in Normandy was virtually isolated except for the routes which led into it through the Paris-Orleans "gap" between the two rivers; there the roads and railroads inevitably became congested and afforded rich opportunities for sabotage and bombing. The Tactical Air Forces also, by a series of concentrated attacks against junctions on the edge of the tactical area during the first few days following the assa ult, drew a line beyond which all enemy rail movement was impossible by day. This line of interdiction originally ran through Pontaubault, Fougeres, Mayenne, Alencon, Dreux, and Evreux, but was readjusted as the ground situation developed. The consequence of these attacks upon enemy communications was that the Germans were compelled to detrain their reinforcement troops in eastern France, after a circuitous approach over a disorganized railway system, and then to move them up to the front by road. Road movement, however, was difficult by reason of the critical oil shortage, apart from the exposure of the columns to Allied bombing and strafing. During the first six months of 1944 the German oil production was reduced by at least 40 percent as a result of the bombing of the plants by the Strategic Air Forces, and the outcome was seen in the trials of the enemy reinforcements and supply columns as they struggled toward Normandy. Whole divisions were moved on seized bicycles, with much of their impedimenta on horse transport, while the heavy equipment had to follow as best it could by rail, usually arriving some time after the men. The 275th Infantry Division, for instance, took a week to move 150 miles from Fougeres. It began the journey by train but was halted by bombing, then the French seized the horses which had been collected to move the division by road, and the destination was eventually reached on foot, movement being possible only at night because of the perils of air strafing by day. The 9th and 10th SS Panzer Divisions took as long to travel from eastern France to Normandy as from Poland (where they had been stationed) to the French frontier; while the men of the 16th GAF Division, having left The Hague by train on 18 June, were forced to make a grand tour of Holland, Belgium, the Rhineland, and eastern France before they eventually reached the front on 3 July. Traveling under such conditions, the reinforcements arrived in Normandy in a piecemeal fashion, and were promptly thrown into battle while still exhausted and unorganized. By mid-July, units had been milked from Brittany, the southwest and west of France, Holland, Poland, and Norway; only the Fifteenth Army in the Pas-de-Calais, waiting for a new invasion which never came, was still untouched. Meanwhile the Allied air forces enjoyed absolute supremacy over the battle area, as indeed over the whole of Nazi-occupied western Europe. During fine weather, a normal total of over 1,000 United States heavy bombers by day and over 1,000 RAF heavy bombers by night was dispatched on strategic missions. Their top priority targets were the German oil refineries, synthetic oil production plants, and dumps, but they were also available for use, at my request, against tactical targets connected with the Normandy front. Unfortunately the prevalent bad weather prevented our full use of the air weapon, operations being repeatedly reduced or canceled for this cause. The weather, however, failed to stop the AEAF (Allied Expeditionary Air Force) from constantly hammering its tactical targets. While in fine weather as man y as 4,000 sorties a day were flown by aircraft of this command, the attacks were continued on the maximum scale possible even under the most adverse conditions. During the first week of the campaign the Tactical Air Forces flew some 35,000 sorties in direct support of ground troops, and by their persistent blows in subsequent weeks against their targets behind the enemy lines-transport, communications, strong points, airfields, fuel dumps, and troop concentrations -- they caused a degree of confusion and dislocation that was essential to the success of our breakthrough in late July. So complete was our air mastery that in fine weather all enemy movement was brought to a standstill by day, while at night the attacks were continued with the aid of flares. Von Rundstedt himself reported that the Allied tactical aircraft controlled not only the main battlefield areas but also the approach routes to a depth of over 100 miles. Even a single soldier, he claimed, was not immune from attack. An important factor in insuring the success of our close-support air operations lay in the establishment of landing strips on French soil, from which our fighter planes could operate. Work began on the preparation of these strips as soon as we obtained a footing on shore, and, thanks to the brilliant work of our engineer services, I was able to announce on the morning of 9 June that for the first time since 1940 Allied air forces were operating from France. 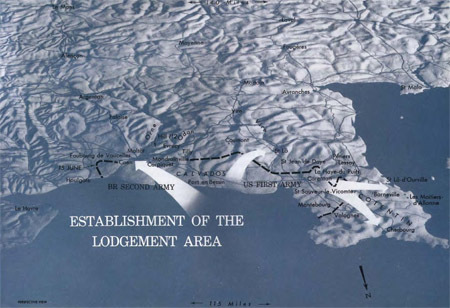 Within three weeks of D-day, 31 Allied squadrons were operating from the beachhead bases. All this extremely effective use of our great air superiority was possible despite the very considerable diversion of our striking power against the enemy's preparations to attack the United Kingdom by means of flying bombs and heavier rocket projectiles. The first flying bombs fell on England during the night of 12-13 June, and the regular attacks commenced three days later. Attacks upon the V-1 sites were difficult by reason of their smallness, the effective nature of their camouflage, their comparative mobility, and the ease with which they could be repaired. For this reason it was considered more profitable to attack the supply dumps, transport facilities, and services. Blows designed to delay progress on the larger, massive concrete structures, of the exact purpose of which we were at the time still uncertain, also required the attentions of large formations of heavy planes, dropping the biggest types of bombs. In contrast to the intensity of the Allied air effort, the activities of the German Air Force, apart from sporadic fighter-bomber attacks by flights of 20 to 30 aircraft on the assault area, were limited to cautious patrolling by day and sea-mining by a small number of heavy bombers at night. We were now to reap the fruits of the long struggle for air supremacy which had cost the Allied air forces so much effort since the start of the war. Following the enemy's failure to take effective action against our forces during the initial stages of the assault, he remained on the defensive, being chiefly concerned with the protection of his bases, stores, and lines of communication. Aggressive support of his ground forces was noticeably lacking, and even defense of their positions against our fighter-bomber attacks was weak and desultory. The enemy was, in fact, in an awkward predicament: To take the offensive when his numerical strength was so inferior to that of the Allies was to court disaster; yet to remain always on the defensive would mean slow attrition and a decline in ground force morale because of the absence of the air cover which had played so large a part in the victories of 1940. The number of GAF planes available for employment in the invasion area had been built up during the six weeks prior to the assault, but this increase in strength was neutralized by our air forces, and post-D-day reinforcement proved less than expected. The GAF fighter bases, from Bordeaux to Belgium, were subjected to attacks of such scope that the enemy was unable to concentrate his fighter resources over the battle zone, and his planes were thus denied effective employment. Normally the Luftwaffe fighter activities were limited to defensive patrolling behind the Germans' own lines, an average of 300-350 sorties per day being flown in fine weather, with a maximum of about 450. There was also some enemy activity against the beaches, and bombing and torpedo attacks against shipping. It was a reflection of this enemy weakness that on '4 June RAF Bomber Command was able to send some 350 heavy bombers against Le Havre and Boulogne in daylight, the first daylight operation in force by the Command since early in the war, and lost only one aircraft on the operation. When the enemy planes did come up, they showed a marked tendency to avoid combat. Only on 12 June did they react in any considerable strength when a mass onslaught was made on French airfields by 1,448 Fortresses and Liberators of the U. S. Eighth Air Force the largest force of heavy bombers hiterto airborne on a single mission. On this occasion the enemy suffered severely at the hands of the Allied fighters and failed to reach the bombers. The reluctance normally shown to engage our planes was doubtless in part dictated by the need to conserve a depleted strength; but there was also noticeable a lack of organization and experience on the part of the German pilots. The persistent RAF night bombing attacks of the past had led the German command to concentrate on the training and development of night fighters, with the result that day fighter pilots were generally of a poorer standard and rarely a match for their Allied opponents. As a consequence of this weakness, our forces-both on operations over the battle area and on long-range strategic daylight missions- frequently encountered no air opposition whatsoever, and the over-all weekly Allied losses averaged only about 1 percent of the aircraft employed.